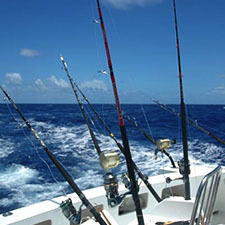 Game Fishing is so popular that enthusiasts can try out all sorts of techniques on the same day jigging, trolling, slow trolling, bottom fishing, shark fishing and swordfish fishing. Rodrigues is surrounded by a large continental plateau with an average depth of 60 m.
Fishing is the traditional livelihood of many Rodriguan families. Because of its geographical location, the fishing spots of Rodrigues favor good catches. Rodrigues is surrounded by a large continental plateau with an average depth of 60m. The entire plateau is covered with numerous spots (small underwater structures such as coral mushrooms) perfect for jigging and bait fishing. In the west there is a spot called “lescalier” perfect for crazy jiggers. Game Fishing is so popular that enthusiasts can try out all sorts of techniques on the same day jigging, trolling, slow trolling, bottom fishing, shark fishing and swordfish fishing. The techniques used depend primarily on the weather conditions: the current, the active zones, the tides, the moon, water temperature, etc. The best game fishing period is between December and April. The Eastern Bank - A high reef located at 50 miles east of Rodrigues, has a shallow bottom that ascends from 2,200 miles to 40 miles and extends over 100 km2. Marlin Boulevard - Located on the east side, is where the blue marlin breeds. Hawkins Banks - Situated at 85m west of Rodrigues, it’s a high reef that ascends from 500m to 2000m and over 400km2, and is better known as the ‘hot spot”. There are 2 main big game fishing companies on the island where day outings, overnight and weekly packages are available.